President Keith Bearden and event board member Keith Rudolph installed KZ on Saturday, February 4, 2017 during the Arizona Music Educators Association conference in Mesa, Arizona. Twenty-five members were pinned and presented membership certificates. The tireless efforts of Mr. Raymond Laffin, past president of (Gamma-Indiana, now residing in Arizona) alongside brother Rudolph made this dream a reality. We have a new chapter in Brazil, Beta Zeta! 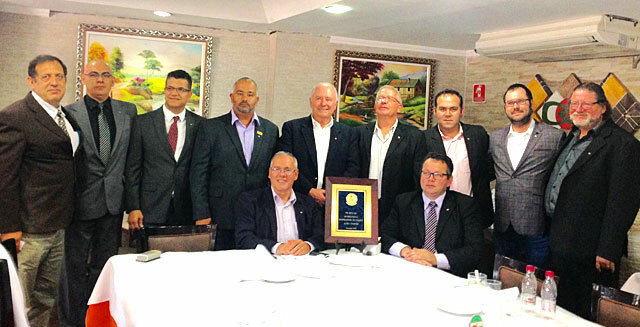 Nine charter members and one honorary member were inducted on February 26, 2016 in São Paulo, Brazil. Congratulations to our new brothers of Phi Beta Mu! Outgoing board member Mike Townsend is recognized and honored for his service to the fraternity. As chair of the Public Relations Portfolio, he championed the use of the Phi Beta Mu website as a vital medium of communication. He was vigilant in accessing and updating membership records, and passionate that he connect with each Phi Beta Mu member. Phi Beta Mu International spearheaded a consortium of member chapters across the country to commission a work in honor of the 75th anniversary of Phi Beta Mu. Composer Mark Camphouse was chosen and the piece, entitled Homage to the Dream, was premiered at the annual clinic/convention of the Texas Bandmasters Convention held in San Antonio, TX on July 21, 2013. In addition to hundreds of band directors, in the audience were over 1,600 high school students, a scheduled activity as part of the TBA Student Leadership Day. The work also commemorates the 50th anniversary of Dr. Martin Luther King’s speech of August 28, 1963, I Have a Dream. The work was beautifully performed by the Greater Dallas Youth Orchestra Wind Symphony with the composer conducting. Dr. Nicholas Williams [Alpha Chapter] is the conductor of the group and graciously agreed to have his group premiere the work. Texas’ Alpha Chapter of Phi Beta Mu [founding chapter] also celebrated its 75th anniversary and was pleased to be a contributor/host to the commission’s premiere. Mark Camphouse’s appearance at TBA was sponsored by Phi Beta Mu International [Paul Worosello, President; Sheryl Bowhay, Immediate Past President], and Texas Bandmaster Association [Fred Velez, President; Mike Brashear, Executive Secretary]. The 75th anniversary commission, Homage to the Dream, is being self-published by Mark Camphouse. Anyone interested in performing this work may contact Mark Camphouse at: mcamphou@gmu.edu. For more information go to markcamphouse.com. “The Queen’s Diamond Jubilee Medal in 2012” was awarded to Brothers Paul Sweet of Wetaskiwin and Mike Townsend of Grande Prairie for their long and outstanding volunteer service in music to their respective communities. Paul and Mike are active members of Mu Alpha Chapter in Alberta Canada. Being selected by their communities to receive The Queen’s Diamond Jubilee Medal is a great tribute to their many years of dedicated service to music. We are all very proud of you. Although born in Ropesville, Texas in 1933, a man who developed a love for cowboys, cattle, cars and music, Dr. McBeth was nonetheless a true Arkansas diamond. McBeth attended Hardin-Simmons University and played in the Cowboy Band in Abilene, Texas where he was presented the Presley Award for Outstanding Bandsman at Hardin-Simmons. He served in the military from 1954 to 1956 with the 101st Airborne Band and 98th Army Band. Dr. McBeth was an active member of Phi Beta Mu Omicron Chapter and was the 1997 Phi Beta Mu International Outstanding Contributor to Bands. He served as Professor of Music and Resident Composer at Ouachita Baptist University in Arkadelphia, Arkansas from 1957 to 1996. The most outstanding of his awards have been the Presley Award at Hardin-Simmons University; the Howard Hanson Prize at the Eastman School of Music for his Third Symphony; recipient of an ASCAP Special Award each consecutive year from 1965 to the present; the American School Band Directors Association’s Edwin Franko Goldman Award; elected Fellow of the American Wind and Percussion Artists by the National Band Association; Phi Mu Alpha Sinfonia’s 1988 American Man of Music; Kappa Kappa Psi’s National Service to Music Award; Midwest International Band and Orchestra Clinic’s 1993 Medal of Honor, and Past President of the American Bandmasters Association. Dr. McBeth was music director of the Arkansas Symphony in Little Rock, and in 1975 was appointed Composer Laureate of the State of Arkansas by the Governor. His greatest treasures, however, were his dear wife Mary, son Matt, and daughter Laura. Then came the in-laws and grandchildren — he loved them all! Dr. McBeth established himself as one of the pre-eminent composers in the field of music for wind band, producing a body of work which is internationally recognized as among the finest of its kind. ASBOA commissioned McBeth to write Grace Praeludium to honor the many years of faithful, selfless service of Raymond [1992 Phi Beta Mu International Outstanding Contributor to Bands] and Ruth Brandon. That piece was premiered at the 1982 Arkansas All-State Band Concert under his direction. 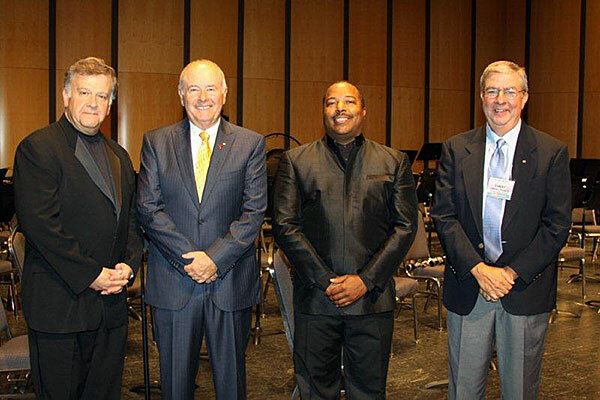 So many students fondly remember the 1994 All-State experience with Dr. McBeth which also included a second concert in June at the national ASBDA Convention that was held in Hot Springs, Arkansas. We will continue to be able to play, conduct and listen to his amazing music. We will remember the incredible times we were able to share with him. One minute telling us about exciting and beautiful music or how to improve the sound of our bands — the next telling a funny story. Everyone was his friend — he genuinely loved people! The world lost an extraordinary musician — Arkansas lost a friend. How blessed we were to have crossed paths. Heaven is a little richer now. Hear interview with Dr. McBeth courtesy of the Arkansas Educational Television Network from their “Men and Women of Distinction” series. 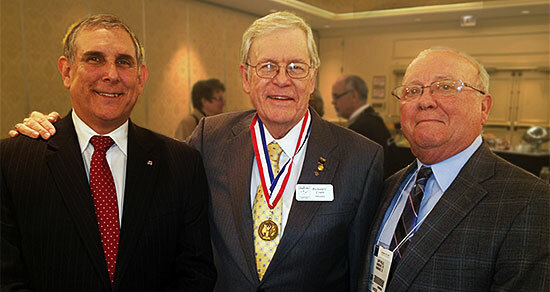 Phi Beta Mu International announces the induction of three of our most distinguished colleagues: Richard Crain, James Slutz, and Robert Eklund. They have served Phi Beta Mu with passion and integrity and we acknowledge their long service and commitment to the International organization and our profession. JAMES SLUTZ was the Editor of the Phi Beta Mu Report for over two decades — a role he executed with passion, dedication and integrity. In turn, ROBERT EKLUND developed and implemented the International website in 2001 and has served as its webmaster since its inception. Robert has shared his expertise and given countless hours of his time to ensure the longevity and health of Phi Beta Mu International. James and Robert have collectively served Phi Beta Mu International for over 30 years. They have facilitated the communications of our organization from the traditional medium of print to the virtual communication of the contemporary website. The scope of the Phi Beta Mu International Bandmasters Fraternity would be not be what it is today without the contributions and sacrifice of these gentlemen. We are grateful for their gifts of time, energy, and expertise. They have given of themselves and we are richer for it. The debt is ours … thank you!